Can Minsk talks help resolve Ukraine crisis? 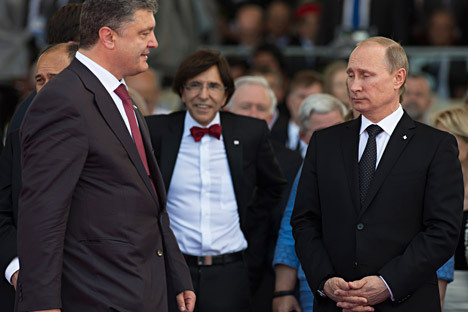 Vladimir Putin and Petro Poroshenko, will meet on August 26 at the summit of the Customs Union and Ukraine. It is not clear whether they will have a stand-alone meeting. However, political analysts tell RIR that a breakthrough is possible. First of all, Ukraine is trying to create the impression that it is looking for political solutions to the problem. In Europe and the United States diplomacy is preferred to a military solution to the conflict, so Kiev will by all means try to create the appearance of its willingness to negotiate with Moscow. Ukraine will demand the unconditional withdrawal of support for the militias in the Lugansk and Donetsk people's republics during the talks in Minsk. Moscow cannot agree to these terms and conditions, because it has stated that throughout the conflict it has not provided any military support to the republics of the southeast. Therefore, agreeing with the conditions of Kiev would mean recognition of aid from Moscow to the separatists. Russia, in turn, requires Ukraine to stop the fighting in the southeast and to allow a humanitarian convoy to enter the war-torn republic. So what we have right now is an impasse that will be very difficult to resolve and to expect a breakthrough in solving the crisis during the Ukrainian talks in Minsk is ill-advised. Formally, the talks will be about the sanctions imposed by Ukraine in relation to Russia, but in fact they will focus on the economic war that Kiev has declared on Moscow. It will also discuss the issue of gas supplies to Europe, as it is well-known that the last rounds of negotiations on this issue led nowhere. However, there is no reason to expect any progress here either. Poroshenko is arriving with representatives from the European Union and, formally, each side will present its position. However, behind the scenes Kiev and the EU are united in their opinion of what any contracts should look like. The Russian media talks a lot about the worries in Europe about possible sanctions by Ukraine involving the transit of Russian gas, but this is actually just an act. In Europe, this would be preferable, as this step would give Kiev another way of putting pressure on Moscow: They would sell gas at the border and refuse all transit completely, saying they don’t need the South Stream pipeline. So, expect an ultimatum from Ukraine and the EU. The meeting will be held in Minsk in the format of the Customs Union with Ukraine with the participation of commissioners: It is a quite complicated, and, most importantly, new and non-standard format of talks. For each side the topics are obvious. The Customs Union of Belarus and Kazakhstan is more interested in the way they will build economic relations with Ukraine after the ratification of the agreement with the EU. For Europeans, it is important what is going to happen to the gas contracts and gas supply. Russia is interested in ending the war in the east of Ukraine. All these topics will intertwine in an attempt to find a balance and develop something akin to a package solution. The chances of success, especially since it is all happening so fast, are slim. Political progress towards a ceasefire in the southeast of Ukraine cannot be achieved. This is due to the fact that the participants in the negotiations for military action are, unfortunately, only concerned about strengthening their own political positions. So the logic that we can have a ceasefire and then begin to address other issues will not work here. It requires a reverse approach. First, identify the scope of the deal, which would include all of these questions, and only afterwards seek a ceasefire. The talks in Minsk are just an attempt by Ukraine and the Western powers supporting it to somehow force Russia into sponsoring Kiev’s plummeting economy. I do not believe that Ukraine is ready to make concessions on political issues that most likely won’t even be discussed there, because discussing them without the Americans who are backing them does not make sense. This means that Kiev wants to use the negotiations in order to put pressure on the Customs Union and Russia to create a friendlier economic policy towards Ukraine. The West, in this sense, is tying a tricky knot: They may cancel part of the sanctions, and we are also going to have to cancel our own. But the guilt, in any case, will lie with Russia. The West has always worked on achieving one outcome: It wants a Ukraine politically fully oriented to the West, and economically, Russia must bear its share of responsibility for supporting a political regime that is hostile to it. They were very successful in the 90s and early 2000s, but in the mid-2000s things got worse, giving rise to tension, which, in my opinion, resulted in [the] Maidan [uprising]. These negotiations are needed by Kiev, Europe, and Americans, because they do not want to pay for the Ukrainian problem. They want us to pay for it, they want the Russian markets to remain open for Ukrainian products, and they want to solve the gas issue in a way that benefits Ukraine. I do not know how the Kremlin and Putin are going to act on these issues. At this stage we should not support the Ukrainian economy, because it means that we support the Kiev authorities, who are acting aggressively towards us. Do not expect progress in matters involving the start of a political process in Ukraine. Kiev will try to skate around all these issues, and Russia may raise them. Kiev’s goal is to fool everyone and gain preferential status in the economic sense, and the goal of Moscow should at least be the discussion of political issues.